"Since its establishment almost 75 years ago, we have not been able to fully document or conduct research on the unique natural and cultural resources of Lava Beds." -- Craig Dorman, Superintendent, Lava Beds National Monument. The photomonitoring project, established in 1990 to provide visual documentation of key features within the monument, recently demonstrated the value of having base line data for natural phenomena. 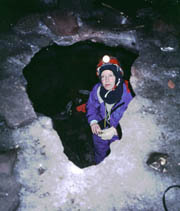 In late 1996, a small hole appeared in the smooth ice floor of Merrill Cave and began to rapidly enlarge. Photographs of the site taken at intervals over the last decade provided clear evidence of sudden rapid deterioration of the ice, enabling the monument to make changes in the management of the cave. A caver sits in the ice chamber below what was once a smooth ice floor. Lava Beds National Monument is charged with managing and protecting its resources. Without adequate knowledge this mandate is difficult to fulfill. On the eve of the 75th anniversary of the monument, there is still much we do not know. Only thirty of the 410 known caves have been thoroughly documented. Many contain rare features, plants, animals, or archeological materials. Given the increase in visitation each year, some contents may be lost to theft or vandalism before they have been documented. Similar gaps in knowledge exist in history, archeology, botany, and wildlife biology. The monument staff is committed to other duties, particularly visitor services and resource management. They often lack the knowledge required to conduct specialized scientific research. For some years scientists from academia and industry, assisted by eager volunteers, have been helping to fill this gap. However, their efforts have been hampered by the lack of on-site work space and housing. Recently, two research projects were cancelled due to lack of adequate support facilities. Many of the principal investigators are from the academic community, either students or professors, who must schedule their field time around class and teaching obligations. Others are volunteers who take time from their regular jobs. Furthermore, their funding is limited and seldom covers more than equipment and supplies. Time spent driving and the expense of motels and restaurants sharply reduce the time actually devoted to research. All to often, groups hoping to work in the Park have been discouraged by the lack of facilities, and decided to go elsewhere. By providing sleeping and cooking facilities as well as a research lab and a meeting room within the monument, the Lava Beds Research Center hopes to draw these researchers back to the monument.